Hundreds of thousands of people take to Lake Tahoe’s woods, mountains, meadows and waters to escape into nature—to experience its beauty, its solitude and its recreational opportunities. The vast majority make their way in the wilderness on manmade trails, however, which don’t magically appear between the pines, brush and boulders. The Tahoe region has a number of nonprofit and volunteer groups that do the tireless work of planning, building and maintaining hundreds of miles of public trails. Groups like the Tahoe Rim Trail Association (TRTA), Tahoe Area Mountain Bike Association, Truckee Trails Foundation, Truckee Donner Land Trust and Sierra Buttes Trail Stewardship, in coordination with the U.S. Forest Service (USFS) and other agencies, are planning a wide range of new trails from South Lake Tahoe to the Lost Sierra in 2016. 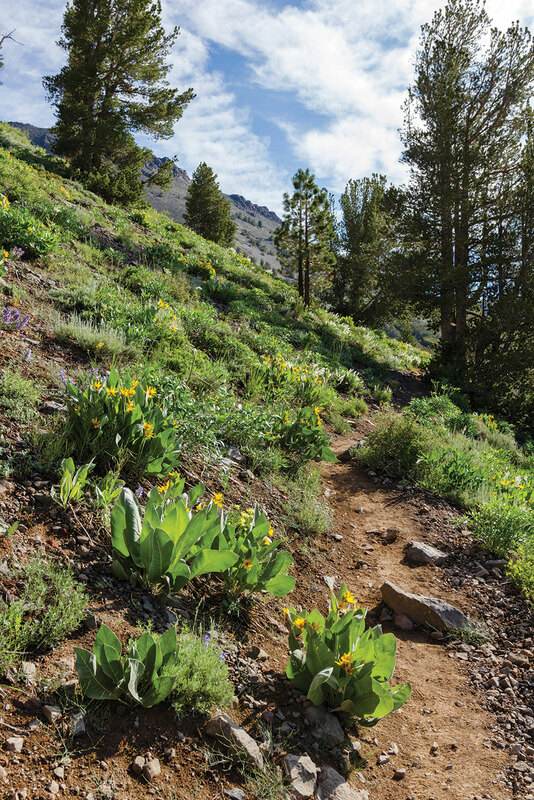 On the 165-mile lake-circling Tahoe Rim Trail, the TRTA has plans to replace an old fire road slog in Mott Canyon in the Heavenly area with about a quarter-mile of new singletrack, says Mary Bennington, the association’s executive director. The segment is part of a popular route taking users up from Kingsbury Grade to the scenic Monument Pass, passing old-growth junipers and views both down to Tahoe and the Carson Valley as it continues on to Star Lake beneath Freel Peak, Tahoe’s highest mountain. Tahoe Area Mountain Bike Association (TAMBA) and the Lake Tahoe Basin Management Unit of the USFS are undertaking a major reroute of the old Kingsbury Stinger OHV (Off Highway Vehicle) trail. Currently, because of the bad routing, the Stinger Trail doesn’t get much use by hikers and bikers, says Jacob Quinn, USFS trails engineer, but the new route, expanding the trail from about 2.5 to about 4.5 miles, will offer better views and interesting features and explore big trees in the region. A $10,000 donation from Tahoe resident Chris MacNamara will also allow TAMBA to build a connector down to the neighborhood below the Stinger Trail, adding another mile of non-motorized multiuse trail, Joell says. In Heavenly, TAMBA is assisting on the Panorama Trail that connects mid-mountain to the Tahoe Rim Trail with about 5 miles of new singletrack, which adds a missing link connecting users from the gondola viewpoint to the Stagecoach Lodge. Just outside the Basin, TAMBA is working on the Belli Ranch Trail above Reno as part of a long-term goal to connect Galena to Verdi along the Sierra Front, Joell says. The 2016 segment would add 10 miles of new routes (7 miles of new trail) from the Hunter Creek Trailhead above Reno, and would be open to hikers, bikers and equestrians. Five miles of new trail named the Tamarack Lake Trail will connect Sky Tavern Ski Area with Relay Peak Road, staying out of the wilderness area to keep it multiuse. Up higher, above Incline Village, TAMBA is working to bring the popular Incline Flume Trail to official status by working with the Nevada Land Trust to transfer the private property portion of the trail to USFS management, Joell says, which likely won’t be done until 2017. Above Tahoe City, TAMBA has its sights set on the Oncelot Trail in Burton Creek State Park, replacing an eroding and unsustainable remnant from the logging era with a small segment of new trail (less than a mile) that will be more fun for users, Joell says. Another segment above that on Forest Service land, dubbed the Fiberboard Bypass, skips the Fiberboard dirt road and creates a singletrack connection from Tahoe City up to the Tahoe Rim Trail, adding a mile of new trail in total. Truckee Trails Foundation has plans for a new trail on the east side of Highway 267, across from the Northstar entrance. It would connect through Elizabethtown Meadows—recently acquired by the Truckee Donner Land Trust—to Waddle Ranch in the Martis Valley, also partially owned by the land trust. “The trail will access a picnic area in the meadow, and create a more flat, level way into the Waddle Ranch trail system,” says Allison Pedley, executive director of the Trails Foundation. “It’s a great connection to endless big loops and scenic overlooks in Waddle Ranch, perfect for big-mountain bike rides or an after-dinner walk,” adds John Svahn, stewardship director for the land trust. 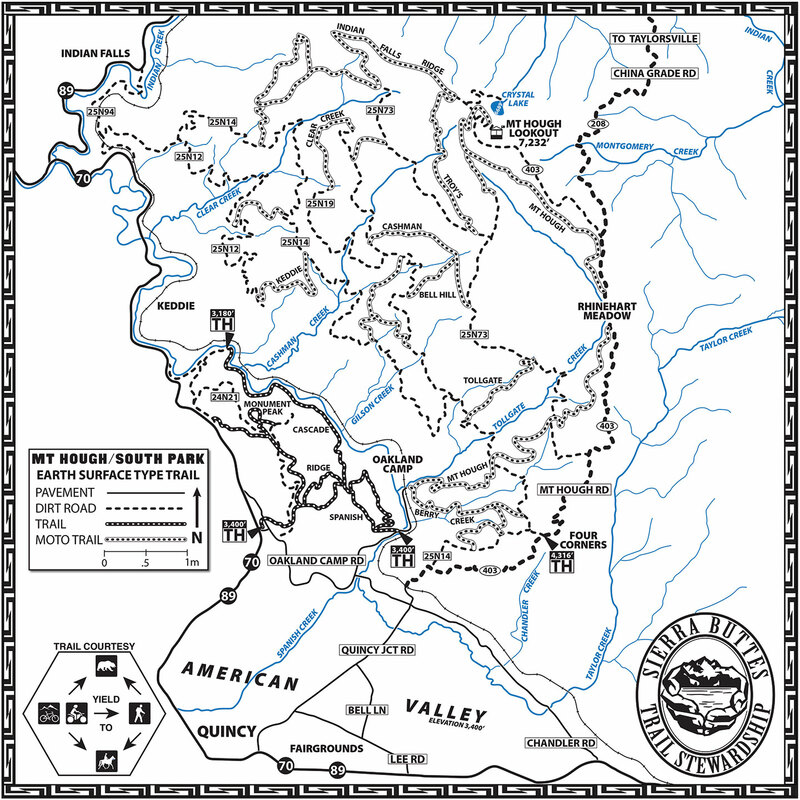 The land trust also has a number of trails planned for Donner Summit this year. The Walter and Esther Hewlett Royal Gorge Rim Trail continues construction this year, linking Serene Lakes to Mount Disney and beyond with about 15 miles of new trails open to hiking, biking and horseback riding, Svahn says. This year’s section connects the Sheep Pen Trailhead off of Old Donner Summit Road to the Royal Gorge Ski Lodge. A hiking-only 1-mile trail from Soda Springs Road to the top of Rowton Peak is also in the works, according to Svahn. “The views of Granite Chief and the American River Gorge are spectacular,” he says. With the land trust’s recent acquisition of the popular Black Wall climbing area off of Old Highway 40, access trails at the mouth of Billy Mack Canyon will add about 2.5 miles of new trails between Black Wall and Babylon Dome. Brought together by Nevada County supervisor Richard Anderson, the Truckee Donner Land Trust, Truckee Trails Foundation and Bicyclists Of Nevada County have teamed up for the Pines To Mines Trail, an 80-mile route that would combine new and existing trails to link Nevada City in the west to Truckee in the east. North of Truckee, in an area collectively known as the Lost Sierra, new and classic trails like the Downieville Downhill, Mills Peak and the Mt. Elwell Trail are gaining national notoriety as mountain bike magnets, thanks in no small part to the Sierra Buttes Trail Stewardship. This year, the stewardship has its eyes on Quincy, with plans for 60 miles of multiple-use OHV trail to be completed by 2018, says Tara Stone, trail programs director for the group. The trails will be built in the Mount Hough area accessed by Highway 70 and Quincy Junction Road. Greyson Howard is a Truckee-based writer who is an avid mountain biker and hiker.